Here’s another past project of mine from a couple of years ago. At that time I was looking for a low-res camera for simple robotics image processing, and all I had experience with was PIC (12, 16, and 18) microcontrollers. So I didn’t really get to work on the images real time (not enough RAM or speed, and I could not find any suitable SRAM around at that time). I think I’ll revisit this project later on using my new TI Stellaris Board. 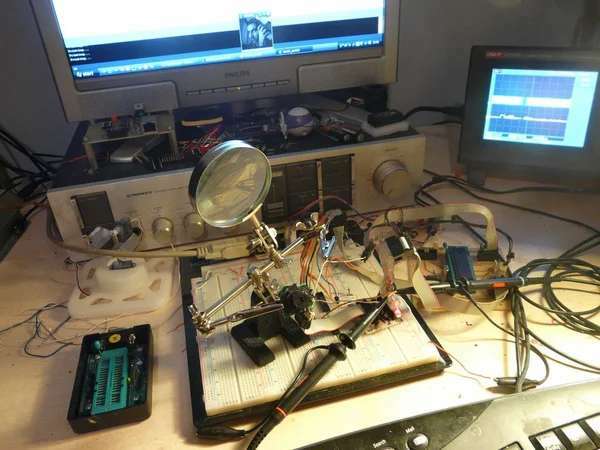 The system consists of a GameBoy Camera (Mitsubishi M64282FP Image Sensor with hardware image processing), an ADC0820 high-speed ADC to convert analog pixel values to digital (the sensor outputs pixels as 2.0V p-p analog values), a LM385-2V5 2.5V micropower voltage reference IC, a PIC18F4660 for processing the digital values to send them later on to a PC via the serial port (or USB with a RS-232 – USB converter).The PC part of the project is a program (uses OpenGL to display the received image, the height of the pixels change according to brightness to have a fake 3D effect) written on Borland C++ Builder. I also still have the simple test programs written in Processing (brightness tracking, etc.). All will be attached. 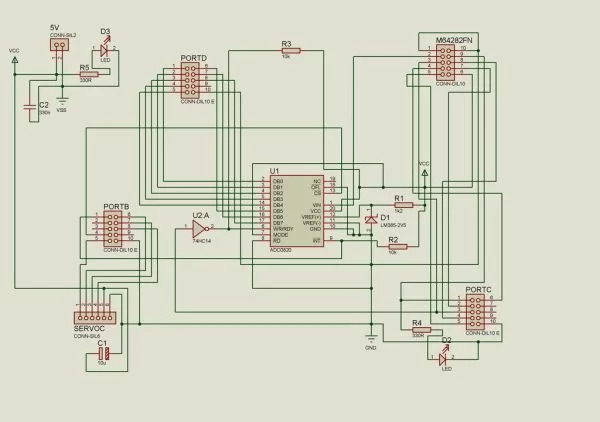 Since the code and the schematics are self explanatory, and the datasheet for the MCU and the image sensor are rather informative, I’m not going to get into much theory here (as always, questions are answered). Here’s the flowchart of the system, which explains what’s going on. 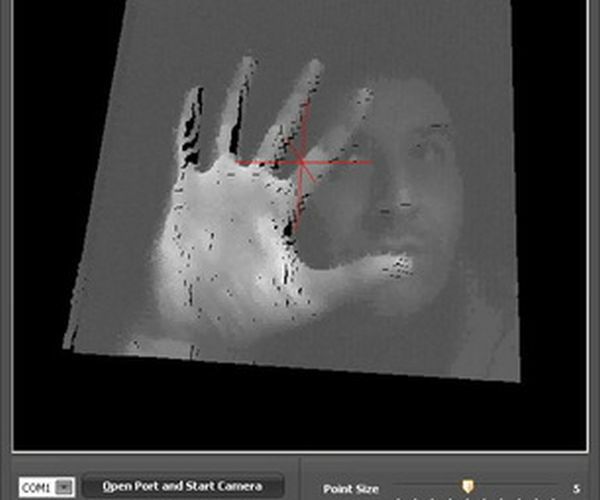 Ignore the USART part (old version), registers are set up from the MCU 🙂 And an animated GIF image showing brightness tracking done with this camera in Processing.The first thing to do before you start is to create a suitable connector for the camera (after opening the cartridge structured box with a tri-wing screwdriver and disconnecting / removing the camera from the main structure). I attached a picture of the pinout, so many people used this image, so I don’t know who to give the credit (here’s one http://www.seattlerobotics.org/encoder/200205/gbcam.html). I used an IDC-10 connector to connect it to my old PIC board (from another project).In the next step we’ll be looking at the schematics and how the system actually functions. This is the card connected to my old PIC board. Since I had one laying around, I just made an expansion card to it for this project. The LED’s are for displaying board power and frame capture. The schematics are a bit tangled since I didn’t care much about pin labeling then (to quickly create the PCB), so please have patience. I’m not going to attach the PIC board schematic and PCB files (but please pay attention to the pictures for pin orientation), since it’s basically a 40-pin PIC board with a crystal, and all the ports are connected to IDC-10 connectors. conversion for each pixel value (74HC14 inverts this signal for the ADC to start the conversion), after a successfull read, ADC sends and interrupt to the PIC, and the PIC sends the digital value to its USART, which finally goes to our PC. For more info on these pins, please refer to the image sensor datasheet attached on the next steps. You’ll understand the schematics better when you read the comments in the code files. @Emrah Ali Pekdemir Can you please send us more projects for this site?